Plus, six things council member Sally Bagshaw saw at the one in San Francisco. On Wednesday, mayor Ed Murray finally announced the location of Seattle’s first Navigation Center, a 24-7, low barrier, dormitory style living facility that is expected to open in spring, eventually serving up to 75 people at a time. Its opening was delayed when the city struggled to find a site (what’s new), but has reached an agreement to house it at the Pearl Warren Building at 606 12th Avenue South in the International District. 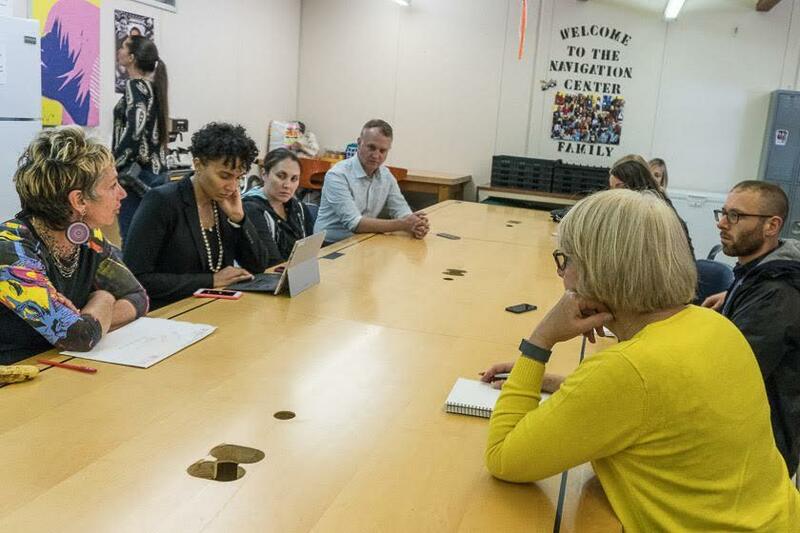 Last May, council member Sally Bagshaw took a trip to tour San Francisco’s Navigation Center, which serves as the model for Seattle’s and has garnered national attention for its innovative approach and success connecting people to services and permanent housing. 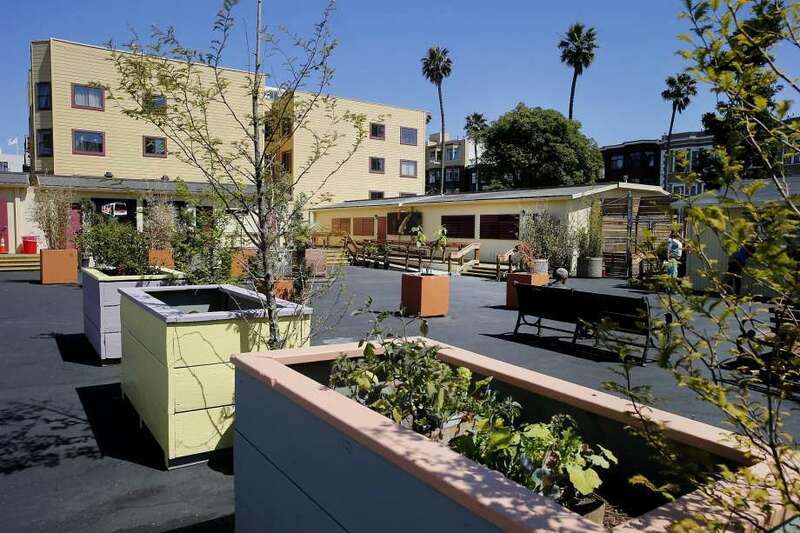 The Navigation Center courtyard at 1950 Mission Street in San Francisco. Well, what’s in them. Visitors can bring and securely store their possessions. There are lockers and under-bed storage boxes, but for larger items like bikes or shopping carts, those containers stand ready. That addresses a couple things. Since most shelters don’t provide storage, people have to schlep their life's possessions as they head out for the day—a huge burden for someone searching for work or housing, or walking miles at a time. Second, theft. Bagshaw says people tell her they are on constant watch at shelters, even keeping their shoes on at night because if not, they’re as good as gone by morning. That is also why Bagshaw is elated about the lockers added to the Roy Street Shelter in early January, a $35-per-unit investment. It’s rare to find a shelter that allows pets, let alone provides donated dog food and volunteer veterinary care. You don’t have to be a homeowner to consider your pet a family member, and for many on the streets, a pet is a lifeline. Bagshaw recalls a particularly frigid night when she saw a man curled up outside with his puppy. He told her he couldn’t go inside because he didn’t want to give him up. At the SF center, Bagshaw says pets could sleep in bed with their owners or stay in kennels at night. So far we’ve got possessions and pets—two of the most common regulations that end up creating barriers to shelter. The last one is partners. If you had to choose between sleeping outside with your loved one, or separating to sleep inside a shelter, what would you do? Bagshaw would go for the tent. “I’d rather be underneath a bridge and be able to stay together, even knowing that I’ll be rousted in the morning,” she says. Seattle delegates meet with staff at the Navigation Center. Unlike some shelters, those struggling with addiction or alcohol use are welcome at the Navigation Center, though use is not allowed on the premises. Case workers focus on meeting immediate needs with one-on-one counseling, then aim to connect people with services and long-term housing. As for Seattle, the city needs some time to renovate and prepare the location, and has said it will set up temporary sites to address needs in the meantime. It will also hold community meetings before the opening. One center will not solve the homelessness crisis, but Bagshaw believes if we can emulate the model multiple times over, it will make a big dent. The fact that she’s heard the word “mollycoddling” from critics doesn’t phase her.